Church Marketing Online Is Back and New and Improved! After taking a hiatus for the last couple of years, we’re bringing Church Marketing Online back out of mothballs. The awareness of the value of church marketing and the number of churches participating in online church marketing has been growing. With more and more demand for information about online church marketing, we felt that we could offer unique insight into ways churches can develop successful online marketing campaigns, increase their influence in their communities, and reach more people with the Gospel of Jesus Christ. We are excited to be able to rejoin you in the conversation about the church can use the internet to grow the church and share the love of Christ. Please join us on Twitter and Facebook and signup for an RSS feed. The Church Marketing Online blog is a ministry of OurChurch.Com. OurChurch.Com is a wonderful place to work for several reasons. One of the biggest reasons, however, is that we do not just think of ourselves as a company, but also a ministry. This is reflected in our goals, services, and how we do business. A little over a year ago Paul Steinbrueck (CEO of OurChurch.Com) and I decided to create the Church Marketing Online blog as a free ministry resource. We wanted to inform churches on ways to market themselves online and equip them with the knowledge to do it. We’ve covered a lot of topics during our tenure and, hopefully, have made an impact in how people view church marketing and what they are doing to market their church and reach people online for Christ. In addition to the Church Marketing Online blog, we also developed a church marketing service designed to help churches market themselves online. We know that you have a lot of other things to do and some of these church marketing strategies can be a bit confusing. We’d love to help you with your church marketing. Please visit the Top Church Search Rankings web page and contact us about how we can help you and your church. 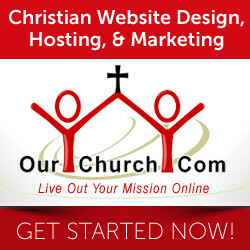 With the completion of the “Is Your Church Social” article series, we have decided to post future articles related to church marketing to OurChurch.Com’s other blog, “Christian Web Trends”. I will still be posting articles about church marketing, but we will be consolidating the articles with the other Christian web trend articles. If you have been receiving the Church Marketing Online RSS feed, I encourage you to sign up for the Christian Web Trends RSS feed. Church Marketing Online will remain…online, as we believe it can still be a great resource for churches looking for information about church marketing. However, we will no longer be updating the site with new articles. I would like to thank all you who have been following the Church Marketing Online blog over the past year and pray that the Lord will bless you in your ministries.